The Georgia Guidestones are big granite columns on a hill in Elbert County, Georgia, USA. Sometimes they are called an "American Stonehenge". 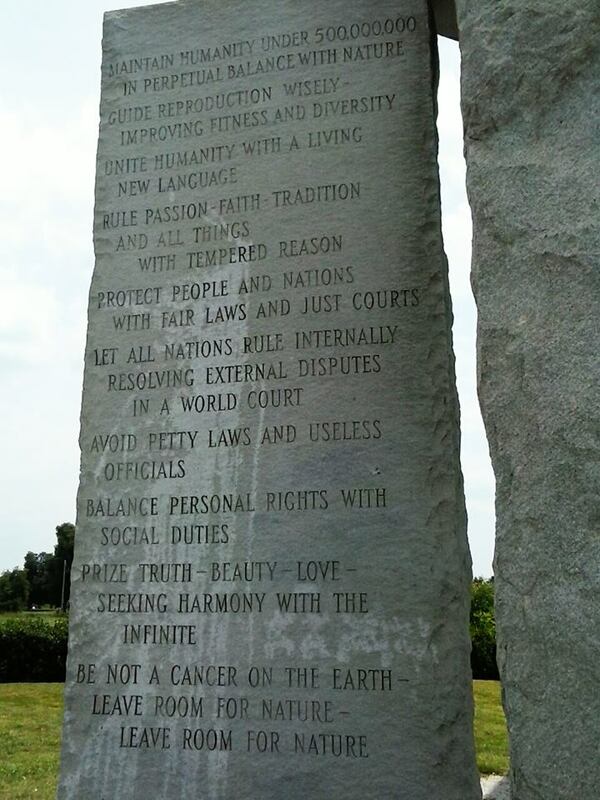 On the granite columns there is a message in which 10 main points are displayed in eight modern languages. The message consists of clues for the survivors of a future apocalypse who need to see a new and especially better civilization. The structure itself is a compass, calendar and clock at the same time. There is a lot of mystery about the origin of the monument: it is not clear who has instructed and why, which has led to different speculations and conspiracy theories. This six meter high monument consists of six granite records and it was raised in Georgia on March 22, 1980. These stones, also known as the American Stonehenge, can be viewed. Although under camera surveillance, because some graffiti was found, but you can visit this sinister monument should you feel that in one way or another there is an urgent need. There are 10 new rules. So-called alternate ten commandments in eight languages, namely in English, Spanish, Swahili, Hindi, Hebrew, Arabic, Chinese and Russian. In addition, you will find a brief summary text in four ancient languages, namely Babylonian, Classical Greek, Sanskrit and Egyptian hieroglyphs. And there is also this book, a manifestation which deals with these matters. 1. Keep the number of people under 500 million in sustainable balance with nature. 2. Send the propagation with understanding so that health and diversity are improved. 4. Manage passion, faith, tradition and all things with moderate reason. 5. Protect the countries and peoples with fair laws and just courts. 6. Let all nations rule their own business, but let them resolve their disputes for a court of law. 7. Avoid ignorant laws and useless officials. 8. Weigh personal rights against social obligations. 9. Reward truth, beauty and love, and seek harmony with infinity. 10. Do not be cancerous on the earth. Leave space for nature. Leave space for nature.